1. 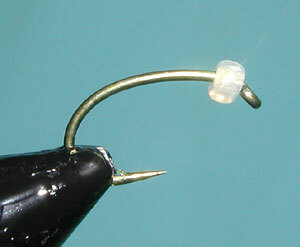 Slide a Glass Bead onto the hook. 2. 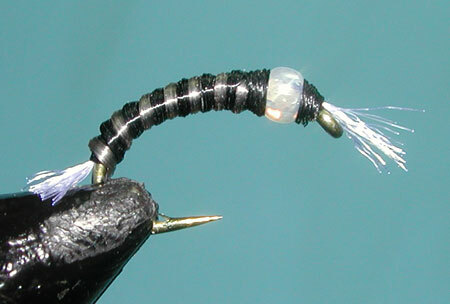 Bring the bead back out of the way, and attach some White Antron Fibers behind the eye for gills. Sometimes, the bead holes are quite small, and you might need to keep all of the thread wraps just behind the eye allow the proper placement of the bead. 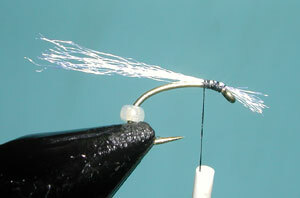 Use a Whip Finish to secure the thread wraps and slide the bead into position. 3. 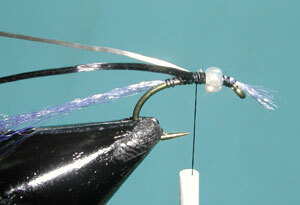 Reattach the thread behind the bead and apply some wraps to snug the bead to the front thread wraps. 4. 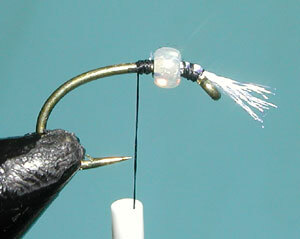 Attach some White Antron Fibers just behind the bead to the top of the hook shank. 5. 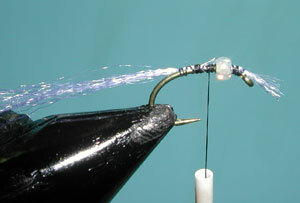 Also attach two strands of Spandflex to the top of the hook shank. I'm using Cream and Black for this buzzer. 6. Wrap the material back to the bend of the hook. Note how compressed the material is to maintain a slender body. 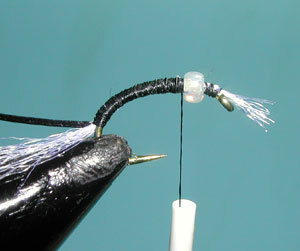 Wrap the thread forward with tight close wraps back to just behind the bead. 7. Wrap the two strands of spanflex forward. By applying little stretch, you can get a segmented appearance. By stretching the material tighter the spanflex will flatten out with thinner segments. Secure with thread wraps just behind the bead. 8. Trim the shuck material and build a thread dam behind the bead that is tapered and almost to the width of the bead. Secure with a whip finish. 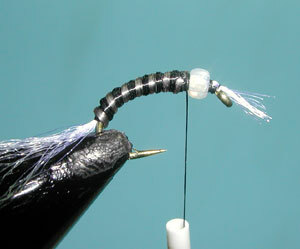 Then reattach the thread in front of the bead and finish it the same way. Apply an acrylic coating such as Sally's Hard as Nails to the entire body and thread wraps.